Encapsulated bacteriophages are more resistant to low stomach pH and live longer in the intestinal tract of broilers. The research, published in Applied and Environmental Microbiology, was conducted jointly by the UAB Group of Molecular Microbiology, led by Dr Montserrat Llagostera, and the ICN2 Supramolecular NanoChemistry and Materials Group, led by ICREA Professor Daniel Maspoch. Scientists at the Universitat Autònoma de Barcelona (UAB) and the ICN2 have developed a nanoencapsulation system based on lipid envelopes to increase the efficacy of bacteriophages in oral phage therapy. This research found that nanoencapsulation confers to bacteriophages a greater resistance to the effects of the stomach low pH while also increasing their residence time in the intestinal tract. The effectiveness of encapsulated bacteriophages has been tested in an animal model of commercial broilers, experimentally infected with the zoonotic bacterium Salmonella. The technology could be applied to different morphologies of bacteriophages for oral phage therapy, both in animals and humans. The research was conducted jointly by the Molecular Microbiology group of the Department of Genetics and Microbiology at the UAB, led by Dr Montserrat Llagostera, and the ICN2 Supramolecular NanoChemistry and Materials Group, led by ICREA Professor Daniel Maspoch. Bacteriophage therapy, also called phage therapy, has proven to be a feasible and effective tool for the control of infections caused by different bacterial pathogens. In previous studies, the Molecular Microbiology Group published the isolation and characterization of three virulent bacteriophages (UAB_Phi20, UAB_Phi78, and UAB_Phi87) specific for salmonella, and showed their effectiveness in reducing the concentration of the zoonotic bacterium salmonella in poultry and different food matrices. In the course of this investigation, limitations relating to the application of the oral phage therapy were detected. Among them was the fact that the stability of bacteriophages was seriously compromised in extremely acidic environments such as the stomach. The residence time of bacteriophages in the intestinal tract was also very low. These limitations affect any type of oral phage therapy, both for animals and humans. 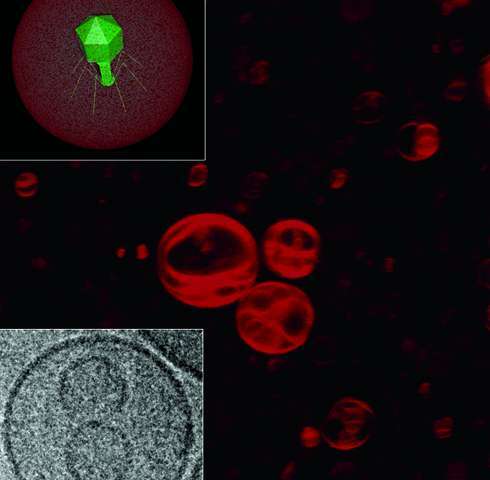 To overcome such limitations, the present study developed a nanoencapsulation system based on lipid capsules (liposomes) and applied it to the three virulent bacteriophages characterized by the UAB researchers. The article compares the effect of encapsulated and non-encapsulated bacteriophages in decreasing the concentration of salmonella in the broilers' ceca. Animal experimentation was performed in the UAB Farms and Experimental Fields facilities, simulating the conditions of a real farm. The study presents nanoscale capsules with a mean diameter of 320 nm and a positive charge of +33 mV. The capsules containing bacteriophages have been observed by Cryo-TEM and confocal microscopy, marking both the capsules and the bacteriophages with two different fluorophores. The lipid coating allows the encapsulated bacteriophages to be significantly more stable in the gastric fluids (pH 2.8), detecting only s loss of 5.4 log units compared to losses of 7.8 log units in the case of non-encapsulated bacteriophages. The coating also significantly improves the retention of bacteriophages in the intestinal tract of broilers. After 72 hours encapsulated bacteriophages were detected in 38.1% of the animals, while non encapsulated ones were only present in 9.5% of the animals. The administration of one daily oral dose of encapsulated bacteriophage for 6 days to broilers experimentally infected with salmonella resulted in protection similar to that obtained with normal bacteriophages. Once the treatment stopped, the protection conferred by not encapsulated bacteriophages disappeared while the one provided by encapsulated bacteriophages persisted for at least a week. These results demonstrate the advantages of using encapsulated bacteriophages in oral phage therapy, as they have also shown to be more stable in size and infective capacity for at least three months at 4ºC. Finally, the nanometric size allows its addition in drinking water and animal feed production.